American flags are everywhere. They can be seen outside public buildings, on houses, on television and movies, even on cars driving by. 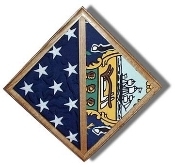 But when it is time for a flag to come down the pole for the last time, what do you do with it? How do you care for it? 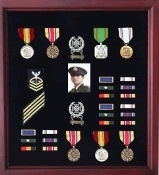 How do you display it? 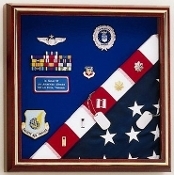 How can you properly respect a flag that was flown over a war zone like Iraq or Afghanistan or flown over the Capitol? 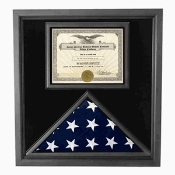 What do you do to show respect for a military flag? 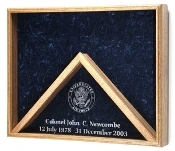 The answer is simple; place the flag into a beautiful oak or cherry case, lovingly crafted in America. 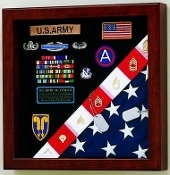 These unique veteran flag shadow boxes highlight and display the flag as it should be seen, with honor and glory. 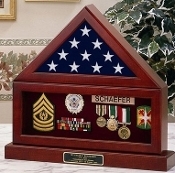 They can be personalized by adding mementos collected by the recipient of the gift and placing them within the veteran flag frame. 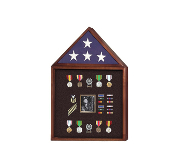 They can display achievements of a fallen hero in your family, as they can hold burial flags as well. They can match the décor of your home and stand out in beauty. 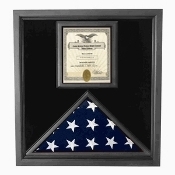 The flexibility that can be found in ordering one of these flag cases is a triumph. You will find exactly what you are looking for with these cases. 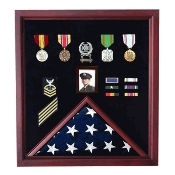 Whether you are looking for a retirement gift for a treasured veteran or a veteran flag case for a current service member, we have what you are looking for. 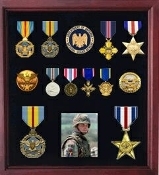 In addition to a tri fold three foot by five foot flag, the case proudly displays a certificate of achievement and medals. 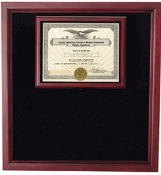 The quality wood and Plexiglas front ensure the safety of the valuable mementos contained within. 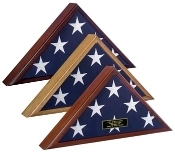 The reviews of these dynamic flag cases are glowing and heartfelt because this is more than an investment in an object that will collect dust. 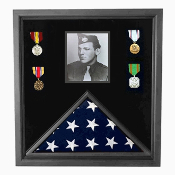 This is a tribute and an honor due to a man or woman that has served out great country. These cases are worthy of the task set before them. They show with style and grace the symbol we fight for. 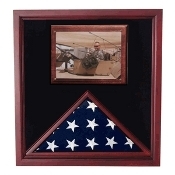 They display the heart of this country, both the flag and the service member.